Last night, I caught a rerun of Dirty Jobs. Mike Rowe was visiting a Sugar Camp and one of his tasks was to help make maple candy. He made a mess, of course, but seeing the candy reminded me that I've never gotten around to making it myself. Well, it was high time to remedy that! The first recipe I tried was for something called Maple Sugar Candy. This was a sandy hard feeling candy, but one that melted in your mouth. Pretty good, but not for me. I did a little research after that and then tried again (my final recipe is adapted from Elizabeth LaBau's on About.com). This one turned out very nice. The candy was creamy, melted in your mouth, and had that yummy maple flavor (be warned: these candies are very sweet). Here's the thing. 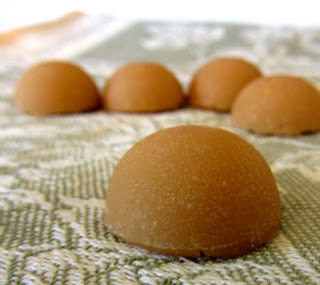 The successful recipe was incredibly similar to penuche (which is brown sugar fudge). Comparable mouth feel and flavor. I might be biased since penuche's one of my favorite candies, but I just don't think these maples were quite as excellent. Why then, you might be asking, would anyone make the maple candies? Well, they are really tasty - don't get me wrong. They have a nice clear maple flavor, which is great. They're easier to make than penuche - there are only two ingredients and very little labor involved. I guess it all comes down to preference. Even if you're a penuche lover like me, I'd encourage you to try these. Give 'em their day in court. See which you like best. And, who said you even have to choose? There's plenty of room for both candies in our hearts! 1. Get ready 1-2 silicon molds or line an 8" X 8" baking dish with parchment paper. 2. Combine the ingredients in a small saucepan set over medium-high heat. Bring to a boil, stirring often. Once the mixture is boiling, reduce the heat to medium. The mixture will get quite foamy, make sure it doesn't overflow! 3. Stop stirring. Attach a candy thermometer. Cook until the candy reaches 235°. Remove the pan from the heat. Leave the thermometer where it is. 4. Allow the candy to cool in the pot, undisturbed, until it reaches 175° (I read that there is also a Maple Fudge - sounds even more identical to penuche - the difference being that you wait until the candy drops to 160° - 110° before moving on to the next step, then pour into a prepared baking dish). 5. Remove the thermometer. Stir the candy with a wooden spoon until it loses it's gloss. Do not over-stir or the candy will harden in the pot and be unpourable. 6. Pour/spoon the candy into the prepared molds or baking dish and let cool completely. 7. Unmold (cut into squares if you used the baking dish) and serve! When I was a kid we use to get them in Canada they were shaped in leafs! I loved that candy this so reminds me thanks for sharing! Thank you :) I love the leaf shaped ones - I wish I'd had that mold!